My parents are here and are helping so much! 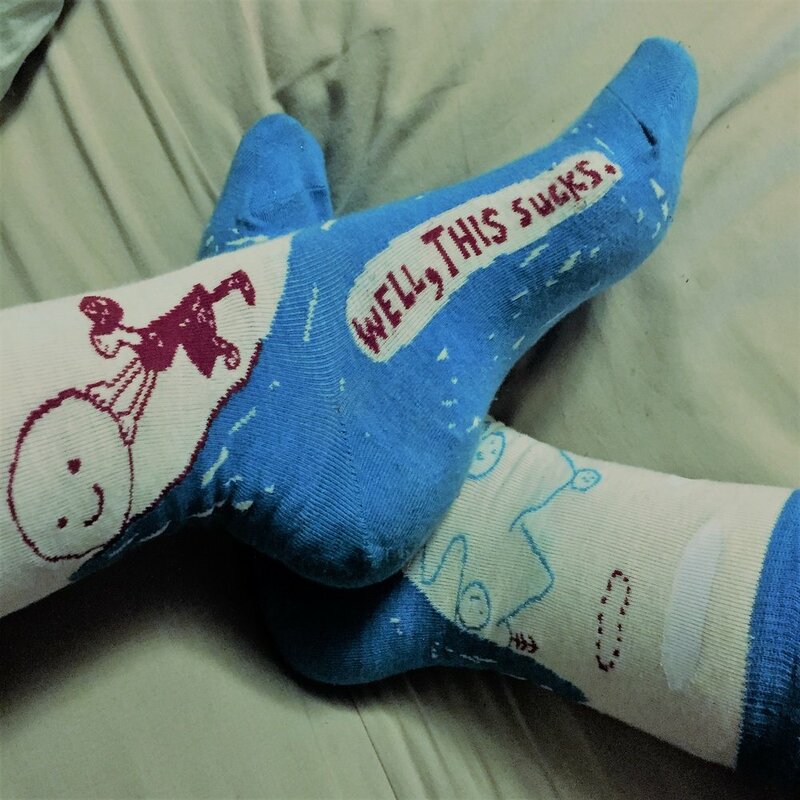 My new socks, very fitting for how we feel. Surgery for the port placement started late, we got settled into his room later in the afternoon; they had accessed the port during surgery so it would be ready for chemo to start that evening. First, he had to be hydrated quite a bit before they started the chemo so they plugged in some hydration to his port and we waited. Atticus was really sore from the surgery and was on some pain meds and still recovering. I noticed he is always very quiet after surgeries, his eyes closed. I always think he is sleeping until a nurse asks him what his pain level is and he will tell them. Chemo started at midnight. They prepped him with some medicine to help with nausea, and I pulled out the oh so comfortable hospital cot and laid down. The first dose, DOXOrubicin, started, was infused over 15 minutes; the second, CISplatin, was infused over four hours. Nurses came and went and I dozed off and on until morning. And so it begins. Doxo. 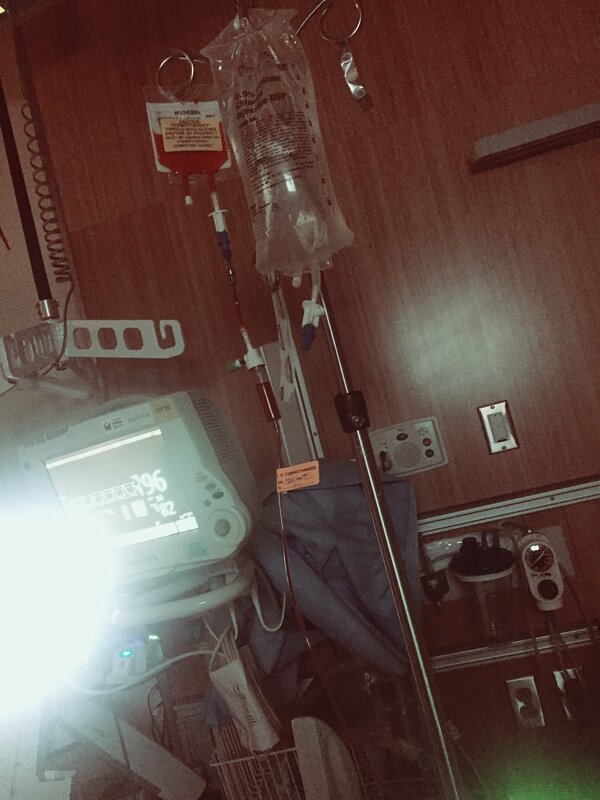 No one ever said chemo was a walk in the sunshine dancing in the daisies, but no amount of reading articles or hearing stories of the side effects could ever prepare me for what was to come. I won't tell a story of strength and smiles through the pain. It was pain and tears and sweating and nausea and embarrassment of a teen already struggling with his changing body and the struggle of cancer on top of it all. Saturday midnight the chemo started all over again. He had been on IV hydration all day since the chemo infusion and then again after the chemo Saturday night. Sunday started the side effects all over again. I understand more now why the chemo is done inpatient and so grateful for it. As per the rumors, the nurses and doctors at Randall are amazing, and kept him as comfortable as possible. There were options of anti-nausea meds and some helped him sleep so he kept choosing that, and I don't blame him for wanting to sleep through all of this. It was incredibly heart-wrenching to watch my son go through this but also comforting knowing he had such a great team watching over him. Sunday we had a little visitor, which was perfect timing. Atticus didn't have much energy to hold the little dog, but petting Ollie and giving him a treat helped soothe him. There were more tests and hydration through Saturday and Sunday night, anti-nausea meds and more sleeping. I had friends come by to bring me food and texting to make sure I was caring for myself as well. I would take walks around the neighborhood, taking different paths each time to find something new, taking pictures and letting it rain on me. Monday Atticus looked a little more life-like and was definitely ready to go home. He was still getting hydrated but they wanted to be sure he could drink water before we went home. 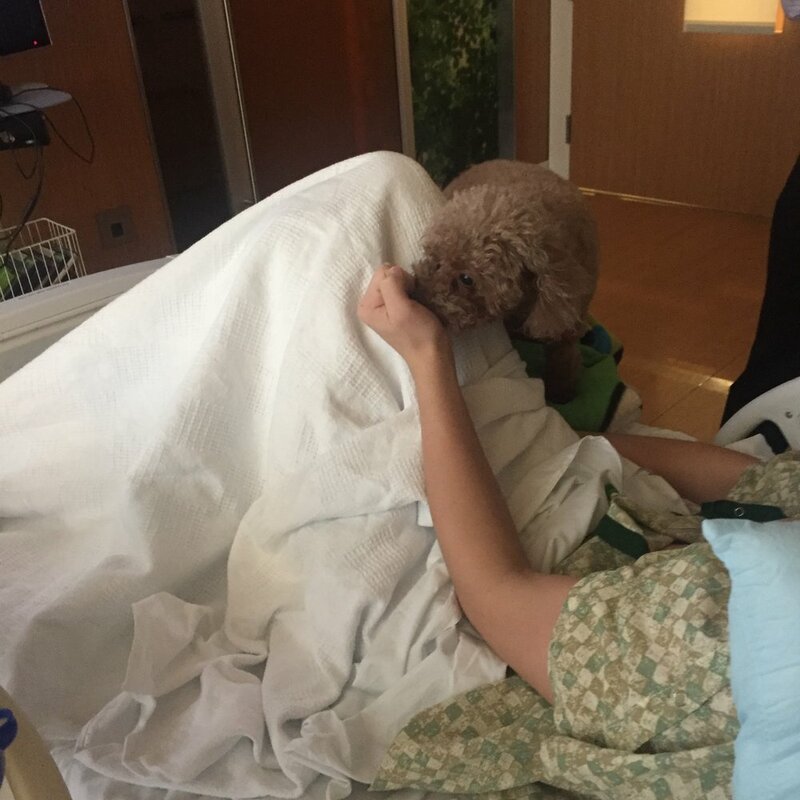 We also had education by our Nurse Case Manager, and I was so glad my friend Kerry and my mom were there to help me process and hear about the care and keeping of Atticus at home. It felt very frightening and overwhelming with fevers and testings and blood transfusions. We went over the treatment plan again, this time with more questions, and clearing up some confusion that had shown up over the weekend. My mom has been here, staying with the girls over the weekend, cleaning house and cooking lots of delicious meals. My dad arrived today, we have appointments lined up for this week, which doesn't include the possible emergencies. It's so nice to have them here as extra support during this difficult first week of treatment. Atticus was a bit better today, asked for his favorite Oma meal, so we were thrilled about that. He's just eating little bits and is wanting to watch a bit of tv and picked up his phone so it's nice to see him coming back. And lastly, a lovely graffiti reminder down the hill from the hospital campus: It's okay to cry.